Here's a sample from the new Fitness Planner coming soon! This colorful Goal Planner page is available in A5 and Letter Size size. 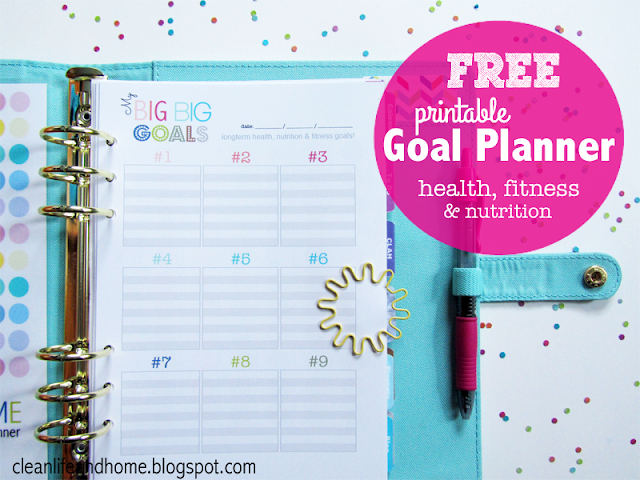 Add this to your planner to set long-term (or short-term) goals for your heath, nutrition and fitness! The PDF is setup for 2-sided printing, but you can choose to print just one side if you like. You can choose either A5 or Letter Size and, of course, you can also resize the pages to fit your planner. 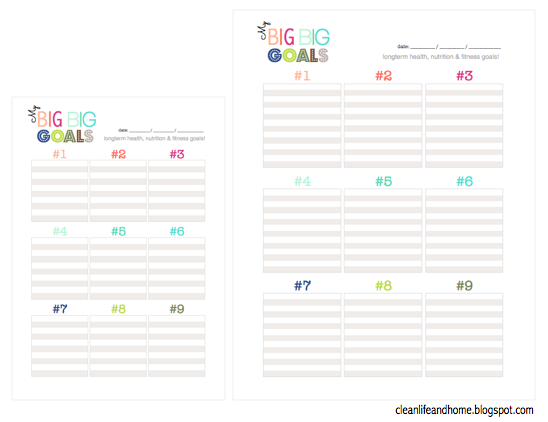 The page above is printed on A5 paper and shown in a large (A5) kikki.K planner. If you would like to resize these pages to fit a different size paper you can visit my page on Resizing PDFs. This planner will show off a new color scheme I've been using. Still bright, but with some muted and natural tones. I never choose just one or two colors. Typically my color schemes have 7 or more colors and a couple alternate colors to add in like gray or brown. I went crazy and used 11 colors this time. In this palette I used some pastel, bright and muted tones and added a taupe accent color to throw in when needed. Adding too many bright colors all together can look too harsh. Adding too many pastel and muted tones can look dull. I think using a good mix of different types of colors makes for a more attractive color scheme. The other reason I leave lots of white space- to keep the pages looking clean. I have to balance out all the colors I'm using. If I add too much color or graphics to the page it starts to look busy. What color schemes do you prefer? Do you like a lot of color or do you prefer to stick with one or two shades?